While searching for Palmer amaranth in a pollinator habitat planting I encountered a few musk thistles. As I always do when I see this weed, I examined flower heads for the presence of the musk thistle weevil. This insect was imported to North America as a biocontrol agent for musk thistle. The adults feed on leaves of thistles, then lay eggs on the heads of musk and related thistle species. Feeding by adults causes minimal damage to the thistles. The larvae burrow into the developing seed heads and feed on the seeds. Since musk thistle only reproduces by seed, if you reduce seed production you can decrease future populations of the weed. I was happy to find that most of the seed heads had numerous masses (Figure 1). Figure 1. Musk thistle weevil egg masses on a musk thistle seedhead. Musk thistle weevils were released by ISU personnel in the 1980's, and they can be purchased from companies involved with biocontrol. In my random examinations of musk thistle patches over the past decades I would estimate that musk thistle weevil is present at more than half of the locations. 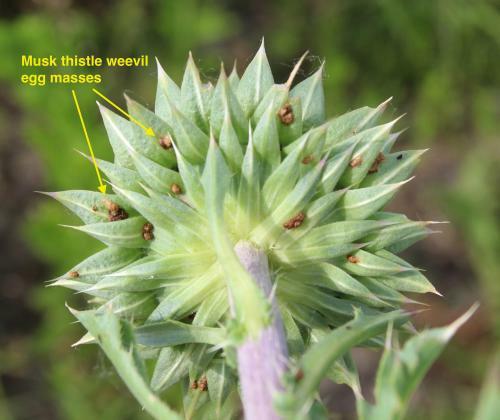 While the weevil obviously isn't eliminating musk thistle from the Iowa landscape, I believe its presence reduces thistle populations from where they would be if the weevil wasn't feeding on seedheads. 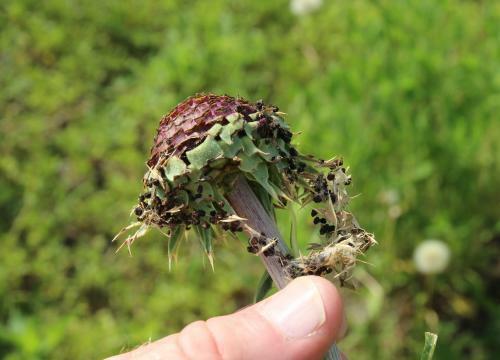 Iowa's fractured landscape prevents expansive infestations of musk thistle, therefore the biocontrol agent doesn't build up to populations that provide a high level of control. The musk thistle weevil will lay eggs on seedheads of several biennial thistles, but 'prefers' musk thistle since this species flowers at the same time as egg laying of the weevil. Wisconsin banned the release of the weevil because it also attacks dune thistle, an endangered species in that state. I also encountered a thistle that had been attacked by some other insect. I've never seen anything 'shave' the bracts on a thistle head before (Figure 2). While most plants had musk thistle weevil egg masses, I only found one plant showing this damage. Figure 2. Musk thistle head with bracts consumed by some insect.